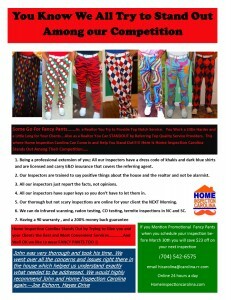 Do you want to grow your home inspection business. I went from struggling one man shop who could barely keep his schedule full. I struggled to get business but couldn’t until I learned how to make creative copy and flyers. We are bombarded with over 3700 daily advertisements or messages. You have to be creative to break through the clutter. I soon went to 7 inspectors and needing more in about 18 months. Here is how I did it. I studied great copywriters and learned how to write copy. 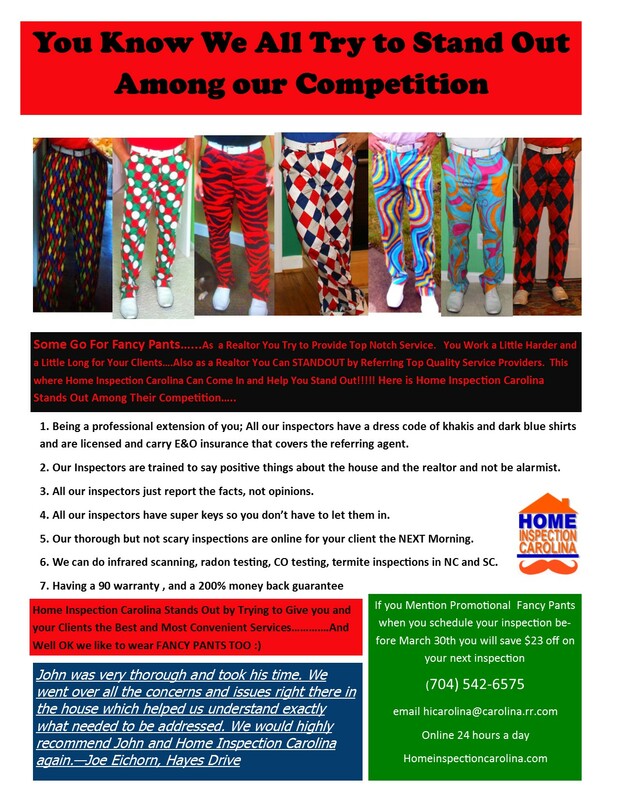 I usually sit down and write 5 flyers for the month (one a week) and download them to an online printer that will print color copies for 7 cents a copy and free shipping. Five or Seven days later 1200 x 5 flyers show up on my porch. I have my marketing materials for the whole month. I hit each office putting candy in a candy bowl I have there and then filling their boxes with flyers. You too can do this by getting my 5 flyers each month. You just have to switch out the logos and contact info and change the testimonials . There’s a simple formula you can use to write more effective Business-To-Business, or B2B copy, that generates leads and makes sales. This formula is similar to what most successful copywriters use when writing 5 to 20 pages of business-to-consumer direct mail packages. However, most business-to-business sales letters selling high tech products or services tend to be about 1 to 2 pages long. Sometimes they can be longer. This means you have to put together a compelling sales message using as few words as possible. Because business-to-business prospects don’t have the time to read long sales letters so you have to quickly and concisely communicate your offer to them. When your prospect opens your letter, reads your print ad, or clicks on your e-mail, the very first thing they see is your headline. It must reach out, grab him or her, and lead them into the copy. According To Advertising Legend David Ogilvy, the headline is the most important part of an ad. On average, five times as many people read the headline as read the body copy. Unfortunately, some writers try to write headlines that are just cute or clever. Others try to pack too much information into the headline. As a result, it gets too complicated and that weakens it. Headlines for B2B products and services must be clear, concise and to the point. Effective headlines can also identify your prospect’s needs and their problems, and then shows how your product will help solve their problem. You can also use the words FREE or No-Risk Guarantee in your headlines. Your headline should hook your prospect’s interest, entices them with a benefit, and urges them to read on. 2. Engage The Reader’s Interest By Identifying A Problem The Reader Has Or A Need That Must Be Filled. Your lead should be direct and to the point. It should immediately identify a problem your prospect may have. The direct approach also helps you get to the point quickly with your copy. Because business buyers don’t have time to sit and try to figure out what you want and what you’re trying to say. Don’t waste your prospect’s time by saying in three paragraphs what could be said in one sentence. Give The Buyer All The Information They Need To Get Interested Enough To Buy, Call For More Information, Or Order A Brochure. You also need to keep in mind that if your product is complicated and difficult to understand you need to simplify the product description. For example, if you’re selling chemicals, pumps, software and other technical or industrial products you need to help your prospect understand what your product is and how they will benefit using the product. Doing this quickly, clearly and simply within the first part of your letter or brochure endears you to the busy executive. You can also give something away to your prospect. Give away some new piece of information or some facts and figures that are interesting and meaningful to your prospects. A benefit is what your product or service will do for the reader. Your prospects will mostly be interested in how your product or service can help them get their work done faster and easier. In other words, they’re more interested in the benefits of your product or service, not in the product or service itself. A benefit is also what makes your product or service worth the price you’re asking. Next you need to prove to your prospects that the product will do what you say it will. You do this by showing your product’s track record, testimonials, credentials, a list of prestigious clients, and product benefits. As I mentioned earlier, when stressing benefits in your copy, be sure to show how the business buyer’s life will be easier, have less stress, or will help them save time and money. If you’ve done the first five steps correctly than you’ve got the readers interested in your product. Now comes the most important part of your promotion. Tell the reader what you want them to do next. Have them call you, fill out a reply card, or tell them to log on to your web site. There are two types of offers that should be on every business reply card, soft offers and hard offers. The hard offer can take two approaches depending on how your copy is going to be used. If your business copy is for a direct sale, then the hard offer asks for payment right now. And then the product will be sent out. Good B2B copy persuades readers by giving them useful information about your product. The more facts you include in your copy, the better response you get. Having a full file of facts makes good copy easy. Simply select the most relevant facts about your product and describe them in a clear, concise, direct fashion. You need to provide a way for your prospects to contact you. At minimum you should provide your address and phone number where your prospect can contact you for more information.